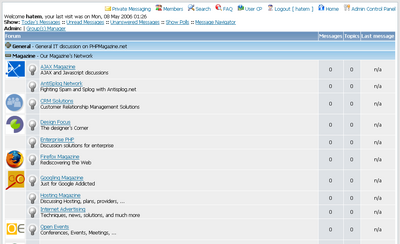 At phpmagazine.net we started moving our forum recently from Vanilla to FUDForum for many reasons. First FUDForum provide a more professional forum solution Fast, Secure with great administration features. The version 2.7.5RC1 have just been released, revealing many new features and improvements. In this new release AJAX is used for threaded message view, topic rating, and category collapsing thing which give it more flexibility for user interface. Via FUDForum. US Government Security Suggest "No AJAX"